Thomas Yarrow was the second child of publican and farmer, John Yarrow and his first wife Ann Whiten of Little Thetford, Cambridgeshire, England. After appearing with his siblings and parents on the censuses for 1841 and 1851, Thomas leaves England in 1854 having signed up, and travels to Bengal to join the forces fighting in the Indian Mutiny. Here he eventually rises to the rank of Sargeant of the 35th Foot (Royal Sussex) Regiment and received the Indian Mutiny Medal during his service. Thomas married widow Catherine O'Keefe (née Lambert) from Ireland whilst in Bengal in 1863, and the couple begin to raise a family. However, most of their children do not survive infancy. 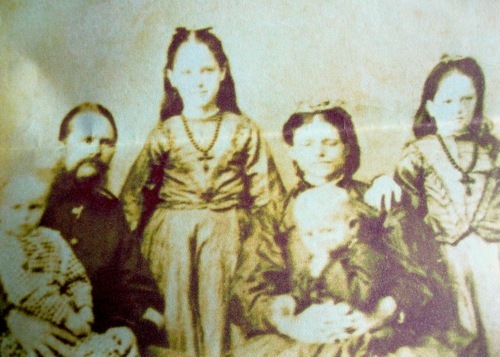 Above: Thomas Yarrow (2nd from left) with his wife Catherine (4th from left) circa 1870. Catherine's daughter from her first marriage stands between them, third from left. In March 1875, after Thomas has served 20 years of service, he leaves the 107th Foot Regiment (soldier number 2809). Here they have two more children, but again their first child doesn't survive into adulthood - dying just months before Catherine herself in late 1888. By 1881, Thomas and his wife have returned to England and live in Bethnal Green, London. The family are joined by Catherine's daughter (also Catherine) from her first marriage - who is noted as having been born in the 'East Indies' and had adopted the Yarrow surname for this census. The third oldest child, Frances Maud, is noted as being born in about 1877 in Downham, Cambridgeshire and therefore the family must have been back in England for a few years. The fourth child of the household, John Yarrow, is noted as having been born in 1880 in Bethnal Green. However, by the time of the 1891 census, Thomas is living alone with his youngest son John. Catherine had died and they are living in Leopold Buildings - a block of densely populated tenement flats. Just 20 years earlier, Bethnal Green was the poorest parish in the whole of London - conditions must have been harsh. Thomas re-treads the aisle in Westminster in 1895, and marries Edith Emily Rawlings, who is about 40 years his junior. Despite this age-gap, she still pre-deceases him aged 35 in 1907. 1832 in Little Thetford, Cambridgeshire, England. 7th October 1832 at St. George's Church in Little Thetford, Cambridgeshire, England. Catherine Lambert (1840-1888) on 12th May 1863, Fyzabad (Faizabad), Uttar Pradesh, India. Edith Emily Rawlings (c.1872-1907) during December 1895 in the Westminster district of London, England. 1841: 8yrs, Little Thetford, Cambridgeshire, England. 1851: 18yrs, The Wheat Sheaf, Little Thetford, Cambridgeshire, England. 1881: 46yrs, 6 Georgina Gardens, Columbia Road, Hackney, London, England. 1891: 54yrs, 19 Leopold Buildings, Bethnal Green, London, England. 1901: 65yrs, 235 Newport Dwellings, St Anne, Soho, London, England. 1911: 76yrs, Alverstoke, Gosport, Hampshire, England. 1854-1857: Private in 35th Foot (Royal Sussex) Regiment. 1857-1858: Corporal in 35th Foot (Royal Sussex) Regiment. 1858-1864: Sergeant in 35th Foot (Royal Sussex) Regiment. 1864-1865: Private in 107th Foot Regiment. 1865-1865: Corporal in 107th Foot Regiment. 1865-1875: Sergeant in 107th Foot Regiment. 1914 at Alverstoke, Gosport, Hampshire, England.